Nearly 11,500 graduating students are expected to walk across the stage in front of CSUN's iconic Delmar T. Oviatt Library later this month as CSUN celebrates its 2017 commencement. Photo by Lee Choo. Nearly 11,500 graduating students are invited to walk across the stage in front of California State University, Northridge’s iconic Delmar T. Oviatt Library to the cheers of family members and friends as CSUN celebrates its 2017 commencement in less than two weeks. “Commencement is always an inspiring time at the university,” said CSUN President Dianne F. Harrison. “It is a reaffirmation of the life-changing opportunities that education provides and a celebration of the achievements of our students. Students and their families and friends gather with the campus community in what is a momentous and joyous occasion. 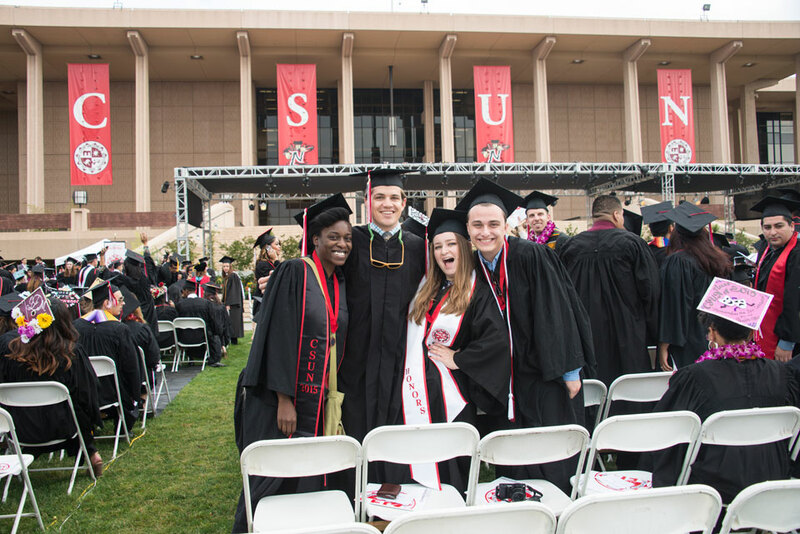 CSUN’s commencement celebrations begin at 6 p.m. on May 13 with Honors Convocation. This year’s speaker will be alumnus and award-winning journalist Julio César Ortiz, a reporter for Univision’s Channel 34 in Los Angeles and an adjunct professor in CSUN’s Department of Journalism. Ortiz, who graduated from CSUN with bachelor’s degrees in journalism and speech communications in 2000, founded the first-ever, 30-minute, weekly Spanish newscast in the California State University system, which laid the foundation for his career as a television reporter serving the Spanish-speaking community. Oritz’s stories have taken him from Los Angeles to Phoenix, to the towns on the U.S.-Mexico border and into the heart of Mexico as he reported on the impact of Mexican immigration to the U.S. His work has earned him local, state and national recognition. He has been nominated for 38 Emmy Awards, winning 19. He received two Regional Edward R. Murrow Awards for his writing. He is the first Mexican-immigrant journalist to receive two consecutive Associated Press awards as writer of the year in the western United States. In 2013, Ortiz earned a master’s degree in marriage and family therapy. He intends to specialize in treating those within the Latino community with mental disorders that have developed as a consequence of acculturation and migration. He launched a bi-weekly segment on Channel 34’s 6 and 11 p.m. broadcasts to connect the Latino community with mental health services. Ortiz established an endowment earlier this year at CSUN for the creation of a scholarship for students who have AB 450, Deferred Action for Childhood Arrivals or other undocumented status. The first $1,000 scholarship will be awarded this fall. CSUN’s first commencement ceremony — for the graduates of the David Nazarian College of Business and Economics — will take place at 8 a.m. on Friday, May 19. The second ceremony — for the graduates of the Mike Curb College of Arts, Media, and Communication — will take place at 6 p.m. on May 19. An honorary Doctor of Humane Letters will be presented to financial journalist and CSUN alumnus Bill Griffeth during this ceremony. Griffeth, who earned his bachelor’s degree in journalism from CSUN in 1980, is anchor of the financial news show “Closing Bell” on CNBC. He is known for his quick wit and ability to think on his feet, as well as his extensive knowledge of the financial markets and market history. Griffeth also has written four books. The most recent is “The Stranger in My Genes: A Memoir,” in which he shares his experience of discovering through a DNA test that the man he thought was his father was not. At 8 a.m. on Saturday, May 20, graduates of the Departments of Child and Adolescent Development, Health Sciences, Kinesiology, Nursing, Physical Therapy, and Recreation and Tourism Management in the College of Health and Human Development will take part in CSUN’s third commencement ceremony. CSUN’s fourth commencement ceremony — for the graduates of the College of Humanities and of the Departments of Communication Disorders and Sciences, Environmental and Occupational Health, and Family and Consumer Sciences in the College of Health and Human Development — will take place at 6 p.m. on May 20. At 8 a.m. on Sunday, May 21, the graduates of the Michael D. Eisner College of Education and of the Departments of Anthropology, Geography and Psychology in the College of Social and Behavioral Sciences will take part in CSUN’s fifth commencement ceremony. CSUN’s sixth ceremony will take place at 6 p.m. on May 21 for the graduates of the remaining departments in the College of Social and Behavioral Sciences – Africana studies, political science, public administration, social work, sociology, and urban studies and planning. At that ceremony, an honorary Doctor of Humane Letters will be presented to substance abuse educator and CSUN alumnus Mike Watanabe. Watanabe, who graduated from CSUN with a bachelor’s degree in sociology in 1973, is president and CEO of Asian American Drug Abuse Program (AADAP). Watanabe is a recognized leader in the field of substance abuse education, prevention, intervention and treatment. Watanabe joined AADAP’s staff in 1975. His success at the agency led to his appointment as president and CEO less than 10 years later. Under his leadership, the organization has grown from a moderate-sized entity to a large, comprehensive agency serving a significant portion of Los Angeles County at 10 sites. CSUN’s seventh and final commencement ceremony will take place at 8 a.m. on Monday, May 22, for the graduates of the College of Engineering and Computer Science and the College of Science and Mathematics. For more information about CSUN’s 2017 Commencement, visit the website http://www.csun.edu/commencement.